Some SSS members have complained that they cannot access the SSS online inquiry system. When they try to access SSS online inquiry, they encounter a largely empty page. This is because the SSS website requires the Internet Explorer browser to run efficiently, and most Internet users don’t use it. In fact, less than 5% of Internet users currently use Internet Explorer, with Google Chrome with the lion’s share at 60% of the web browser market. So this poses a dilemma for those who want to use the SSS website. Most Filipinos prefer to use Google Chrome or Mozilla Firefox to browse the web, and they don’t want to use an old and abandoned browser like Internet Explorer. Internet Explorer still works fine in 2018, and it comes pre-installed in most versions of Windows, so it’s easy to launch it just for the purpose of logging in to the SSS website. But in some cases, Internet Explorer doesn’t come pre-installed and it has to be downloaded and installed first. The good news is that you can still access and log in to the My.SSS website using Chrome or Firefox. In this tutorial, I will teach you how to access the SSS online inquiry system using an unsupported browser. This is useful if you don’t have Internet Explorer in your computer or if you don’t want to use this browser. 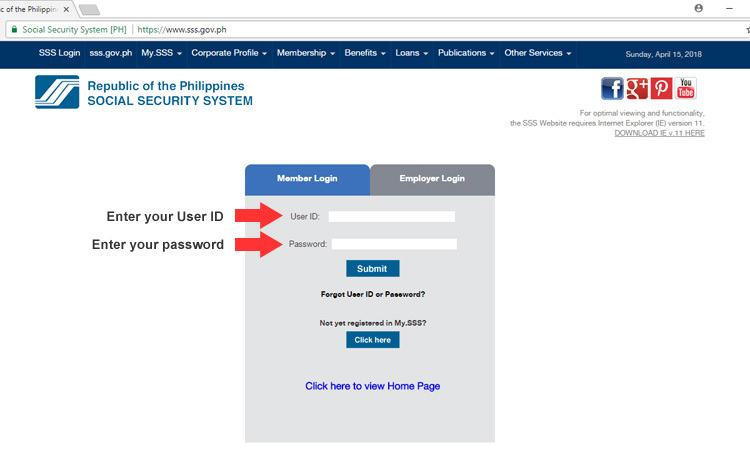 Step 1: Open the SSS website at https://www.sss.gov.ph and enter your User ID and password. Step 2: Hover your mouse cursor over E-SERVICES, then click Inquiry. Step 3: Click the shield icon on the right side of the URL or website address. Step 3: Click the icon or button on the left side of the URL or website address bar, and then click the arrow button on the right side of the popup (see screenshot below). Step 4: Click the “Disable protection for now” button. As you can see, it’s easy to make your Chrome or Firefox browser work so that you can access the full functionality of the SSS website. So if you encounter errors or problems with the SSS website, make sure that you use the Internet Explorer browser or follow the steps above. The SSS website seems to be outdated and hasn’t kept pace with the fast-changing world of Internet technology, so let’s just wait for the agency to update their website to the latest Web standards. For the meantime, you can use this tutorial should you encounter any problems while accessing the SSS online inquiry system.